Bank of Indonesia Governor Perry Warjiyo “called for more policy coordination and harmonization between countries so that emerging markets can lead global growth alongside a recovery in the U.S. economy.” Nusa Dua, Indonesia, October 8, 2018. The outsized cross-border impact of U.S. monetary policy creates obvious challenges for policymakers abroad aiming to maintain financial stability. Governments in the countries most affected have few options to limit the risks created by cyclical changes in dollar interest rates. The available mix of prudential measures includes more stringent capital requirements, limits on foreign currency liabilities, and restrictions on cross-border capital flows. The alternative of trying to counter U.S. monetary stimulus through higher policy interest rates abroad may backfire. Two simple plots tell the story. 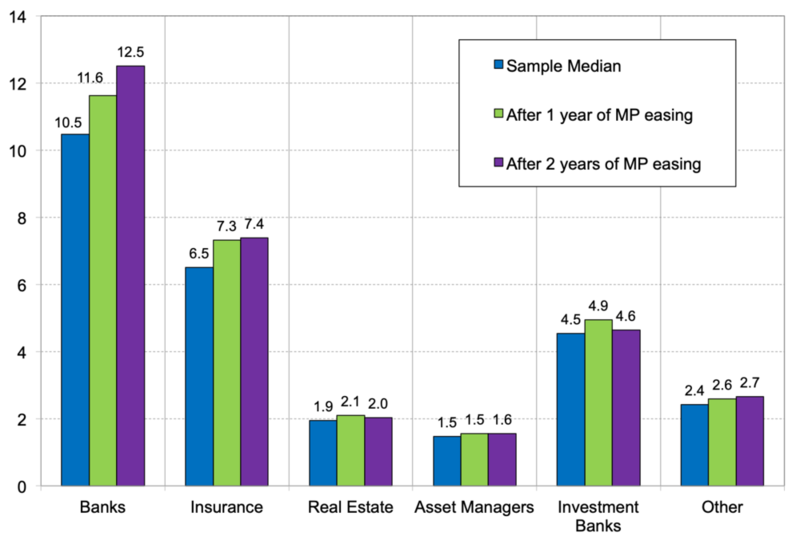 The first highlights the impact of domestic policy in a sample of 20 countries: it shows the median leverage of financial institutions (blue bars) and how it changes one (green) or two (violet) years after a prolonged easing of own-country monetary policy. Unsurprisingly, the impact is sizable. For banks, median leverage across countries is 10.5. But after two consecutive years of policy easing, the level rises to 12.5. Insurance companies also show a notable increase following an extended period of monetary easing—after two years, the median firm’s leverage increases from 6.5 to 7.4. Notes: The figure reports leverage, computed using the market value of equity and book value of liabilities, following a sustained monetary policy easing as measured by the deviations from the eight-quarter average in the two-year sovereign rate. Data for 988 publicly listed financial firms in 17 advanced economies plus Brazil, Mexico, and South Africa. Source: Cecchetti, Mancini-Griffoli, Narita and Sahay, Figure 1. These domestic changes are largely the intended effects of domestic monetary policy easing. When a central bank lowers its policy rate, the aim is to increase both the supply and demand for credit. The unsurprising result is a rise in leverage. Of course, policies that satisfy short-run output and inflation stabilization objectives can create long-run vulnerabilities, so reducing risk today may increase it tomorrow. What about the cross-border impact of U.S. monetary policy on non-U.S. intermediaries? Here, the result is striking: Fed policy easing has a bigger impact on leverage than domestic policy easing in the sample of 19 economies (see the chart below). The median leverage of non-U.S. banks rises from 16.7 to 24.2 after two years of U.S. policy easing (violet bar). Other types of intermediaries also show subsantial increases, with the median leverage of insurers rising from 8.2 to 11.1, and that of real estate firms climbing from 2.1 to 2.9. Over the same period, in sharp contrast to Fed policy, ECB policy changes exhibit virtually no measurable spillovers. Notes: The figure reports leverage, computed using the market value of equity and book value of liabilities, following a sustained U.S. monetary policy easing as measured by the deviations from the eight-quarter average in the two-year sovereign rate. Data for 613 publicly listed financial firms in 16 advanced economies plus Brazil, Mexico, and South Africa. Why does U.S. policy have such an outsized external impact? Part of the answer lies in the role of the dollar in the global financial system. First, roughly 40 percent of all trade is invoiced in dollars (see here). Since the United States accounts for roughly 10 percent of world trade, this means that roughly 30 percent of world trade involves non-American entities pricing their products in dollars. The dollar’s role as the primary invoicing currency leads firms—both financial and nonfinancial—to maintain a significant quantity of U.S. dollar assets and liabilities on their balance sheets. Put differently, dollar dominance gives rise to (and is reinforced by) a large “Global Dollar system” outside the United States (see our earlier post). The BIS reports that U.S. dollar liabilities of non-U.S. banks are on the order of $15 trillion. Foreign exchange swaps lead to additional U.S. dollar exposures that suggest doubling this already large number (see here). And, the U.S. Treasury reports that foreigners hold more than $6 trillion of U.S. Treasury securities. To put these numbers into perspective, total assets of U.S. depository institutions are currently $17 trillion. In other words, the U.S. dollar financial system outside of the United States is larger than the American banking system (see our earlier post). Against this background, when interest rates decline at home, U.S.-based lenders can search for yield in dollars abroad, driving up cross-border lending. And, when U.S. interest rates fall, a weaker dollar brightens the balance sheets of non-U.S. firms with U.S. dollar borrowing. The resulting improvement in their net worth expands their financing capacity (see the discussion here). Not surprisingly, these destabilizing influences reverse when U.S. interest rates rise, sometimes leading to unpleasant surprises for foreign policymakers. Indeed, in a recent paper, Diamond, Hu and Rajan discuss how, through this mechanism, U.S. dollar depreciation can lead to credit booms and busts in other countries. Given this large pro-cyclical (and potentially disruptive) role of the dollar in private financing, what can policymakers outside the United States do to secure financial stability? When Fed easing increases leverage in their economies, non-U.S. policymakers could respond by tightening domestic monetary policy. The effect, however, may be perverse: attracting capital inflows that lead to additional currency appreciation and drive borrowing capacity and leverage up even further. To be effective, the prudential policy framework needs to be comprehensive, or activities will escape the regulatory perimeter. It also needs to be put in place before the spillovers from expansionary U.S. monetary policy become large. Unfortunately, the effectiveness of prudential restrictions in good times (when falling dollar interest rates make credit plentiful)—and their benefits—usually become clear only in bad times (when rising dollar interest rates bring currency depreciation and diminished credit supply making it difficult for borrowers to roll over maturity debt). Reflecting an old financial market adage, we learn who’s swimming without a suit only when the tide goes out. The tide has been receding since 2015, when the Fed began been tightening policy. As a result, the U.S. dollar has appreciated, with the broad exchange rate up by roughly 15 percent since mid-2014; and cross-border lending by U.S. banks has declined by more than 10 percent over the same period. Consequently, firms, households and governments that accumulated substantial dollar-denominated debt during the long period of near-zero U.S. interest rates now face the unpleasant combination of higher interest rates and a more expensive U.S. dollar. The resulting erosion of their net worth makes it more difficult for them to refinance maturing dollar debt. If the scale of U.S. monetary policy tightening proves larger than expected, the risks to financial stability abroad will intensify. So, what are non-U.S. policymakers to do? While we are sympathetic with Bank of Indonesia Governor Perry Warjiyo’s plea for enhanced cooperation (see the opening quote), we see little chance that it will materialize. The mandate of Federal Reserve officials is to stabilize U.S. inflation and employment, not the value of the dollar or the size of cross-border capital flows. U.S. officials will consider spillovers to other economies only insofar as they expect these developments to spill back onto the United States. This comes as no surprise to foreign policymakers. As a result, we expect that other countries will continue to use prudential policies to protect themselves against the potential harm that would come from exchange rate and capital flow volatility over which they have little control. In his 2018 Mundell-Fleming Lecture, Raghuram Rajan goes further, suggesting that countries should counter exchange rate and capital flow volatility through a combination of capital flow management policies and exchange rate intervention. (A stream of the lecture is available here.) For example, countries could implement prudential measures (like the ones we describe) that limit the currency mismatches on the balance sheets of both financial and nonfinancial firms. Putting such restrictions in place before U.S. spillovers grow large should dampen capital inflows. This has the beneficial effect of limiting outflows when they inevitably occur. By making the financial system more resilient, effective prudential policies also facilitate policy interventions that smooth exchange rates. However, once the tide starts receding, it may be too late to don a swimsuit. The bottom line: non-U.S. policymakers should not expect the Federal Reserve to behave in ways that substantially diminish the credit booms and busts that U.S. monetary policy fosters abroad. And, U.S. policymakers should fully expect that others will employ domestic monetary and prudential tools to counter the unwelcome financial vulnerabilities that U.S. policies create abroad. While such policy realism cannot eliminate spillovers, it can make the global financial system a bit safer. Acknowledgement: We thank, without implicating, Tommaso Mancini-Griffoli, Machiko Narita and Ratna Sahay at the IMF for their collaboration with Steve on the paper that provides the basis for this post.